What's Up With The Neck? For many gaits an upright neck is a desirable feature explains Beverly Whittington. There are many attributes that come together to give gaited horses the ability to perform their smooth gaits. As with all breeds, conformation is form to function. The horse’s physical build predispositions it to perform in a particular way. To some degree, training can alter or enhance these base tendencies. Nevertheless, it is always easier to take what nature and a good breeding programme have given a horse and enhance it through training, rather than trying to reinvent the wheel. The upright neck of the ventroflexed (opposite to a rounded back) horse is a signature conformation that often causes the non-gaited horse owner to shake their heads in confusion. The ventroflexed gaits require an upright neck set. The upright neck, often thought of as an ewe-neck, is looked upon as a fault in most non-gaited breeds. 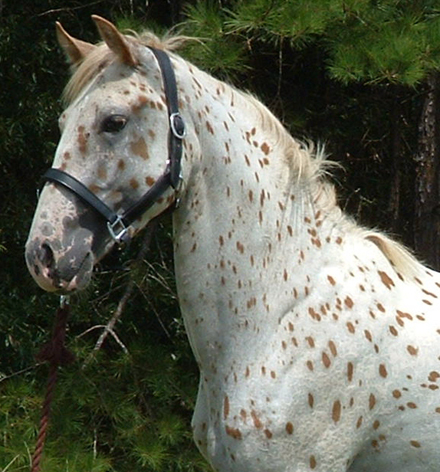 The ewe-neck is a weakness in a horse expected to perform a trot. A level or low neck set will predisposition the horse for the level or rounded back necessary in a trot. The ewe-neck will make it difficult or impossible for a horse to round its back to perform a good trot. This of course, lends itself to being a desirable situation for a breed of horse we do not want to trot! The ewe-neck is easy to spot. The horse would actually have an improved neck if it could be turned to its mirror image. The ewe-neck is not the same as an upright neck, but since they are similar and so different from the lower neck sets seen in most trotting breeds, it often fools the non-gaited equestrian. To perform a ventroflexed gait, the horse needs to hollow its back slightly. It is not structurally or visually (to the human eye) the same as a horse working with a hollow back, but the mechanics are close. Ventroflextion is not the same as a trotting horse working with a hollow back. Gaited horses achieve ventroflextion through continued downward flexion of the lumbosacral junction, a slightly hollow back, a stronger degree of bend in all the joints in the hind leg (hip, stifle, hock, hind fetlock) and a raised root of the neck at the withers. It is virtually impossible for a horse to carry itself in ventroflexion without erect neck carriage. The common gaits performed with a degree of ventroflexion are known by different names in the various breeds: Rack, Saddle Rack, Stepping Rack, Half Rack, Fino, Corto, Largo, Rocky/Mountain Horse Pleasure Gait, Trippel, Singlefoot, Fox Rack, Hreina or Pure Tolt, Pace, Stepping Pace and Sobreandando. These gaits span across most breeds of gaited horses. A natural, upright neck will allow the horse to achieve gait with less effort. The inclination of the horse, structurally, will be to move in the frame that the ventroflexed gaits require. It can be enhanced through training, but the horse’s predisposition is to move that way. Can a horse gait that does not have an upright neck? Yes, several of the gaits do not require the upright neck. It is only one of the elements to perform a good ventroflexed gait. Having an upright neck will not guarantee you strong, natural gait. However, it makes it a lot more likely, especially if the horse is bred for gait!